Zohni Family Dental provides comprehensive dental care for the entire family. Our goals for their new web site included making it easy to find their location and to give quick and clearly-presented access to information about each of their services. The site presents informational and educational videos and is easy to navigate. Zohni Family Dental is an active partner for their families when it comes to dental health! And they wanted a clean, clear, friendly and inviting presentation full of useful information for both their existing and their new prospective patients. 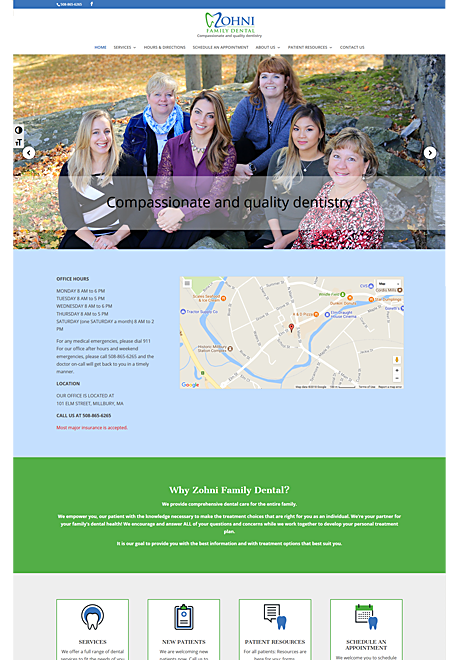 Visit the Zohni Family Dental web site.